Skipper Ash Taylor admits the Cobblers players are disappointed there has been booing at recent matches at Sixfields, but insists they will just ‘get on with the job’. The central defender has captained the team in the past two home games, where manager Jimmy Floyd Hasselbaink has expressed his disappointment at the negativity from the stands following the defeat to Gillingham and the 0-0 draw with Oxford United. Taylor admits ‘it is disappointing’ that it happened, but he says the fans have the right to voice their displeasure at performances, just as every other set of fans do up and down the country. Asked about the reaction of sections of the supporters at the weekend, Taylor said: “It is disappointing, but as players we go out there to give 100 per cent and try and get the job done. “Sometimes it doesn’t happen, and we were disappointed that we didn’t win on Saturday, especially with the chances we had to win the game. “The fans have a right to have a go if they feel they need to, but as players we just get on with the job. Being booed by your own fans isn’t anything new to the experienced Taylor, who said it happened while he was at Aberdeen last season, despite the fact the Dons finished runners-up to all-conquering Celtic in both domestic cup competitions, and in the Scottish Premiership. 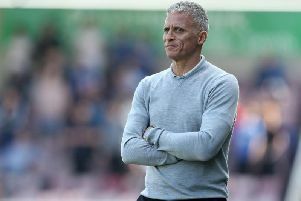 And he knows there is frustration at Sixfields due to the investment there has been in the past two transfer windows, with the skipper admitting the players are frustrated too. “It happened at Aberdeen, and the expectations went through the roof up there because we were winning so many games,” said Taylor. “Then, when the bad result comes, fans are disappointed because they expect you to win every week. “Here, you can understand the frustration of the fans, because we know we have a good squad here, and have good players, and sometimes it just hasn’t gone for us. “On Saturday against Oxford they saw the great performance we put in in the first half when we could have sealed the game, but we didn’t. “But we have to look up, we have to look at Blackpool now. “That is our next objective and we have to go there and get the three points. “We are all fans of football, and if your team doesn’t play well or win, then you are going to show your frustration. One major plus point from the draw with Oxford, was that the Cobblers claimed their first clean sheet of 2018 - indeed, they denied the opposition a goal for the first time since way back on November 25 when they played out a goalless draw with Bury. Defender Taylor was happy about that, but knows the team must shut teams out more often, starting at Blackpool on Saturday. “I was really pleased, as it keeping clean sheets is something I pride myself on and we haven’t had enough of them this year, which is disappointing,” he said. “But it was nice to get one on Saturday, and hopefully we can get another one this weekend. “Last Saturday (against Oxford) was one of those games. “We had so many chances we could have been 3-0 or 4-0 up in the first half, and if we had taken one of them I am sure we would have seen the game through and won.